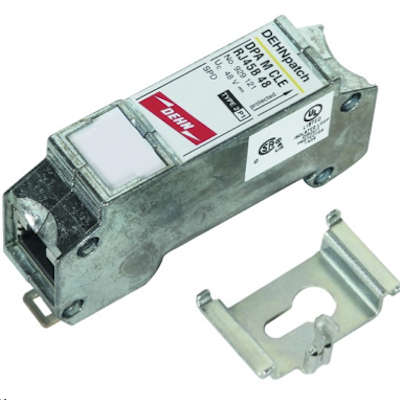 The ethernet surge protector is connected to the ethernet cable of SolarEdge inverters or Enphase Envoy. The ethernet surge protector reduces faults in SolarEdge inverters or Enphase Envoy caused by electrical surges on the communication cabling. The ethernet surge protector is not designed to protect against a direct lightning strike, but rather large electrical surges resulting from lightning strikes occurring within the vicinity. The ethernet surge protector is designed to divert electrical surges to ground when a surge is detected on the circuit. The ethernet surge protector is designed for DIN rail mounting and can be pre-installed in the solar distribution board or be placed in line with the ethernet cable. This device is optional for Enphase system if Wi-Fi is used.